If you mixed together the audacity, marketing genius and addiction to spectacle of PT Barnum with the artistic sensibilities, knack for finding talent and the ability to articulate a vision of new art from the late great Serge Diaghilev you might end up with something like the impresario Normand Tourelle. As a man who pushes the envelope of performance genres and makes no small plans, it is completely fitting that Chicago, the City of Big Shoulders and folks like Daniel Burnham, should host Tourelle’s latest oevre: Odysseo, an immersive environment housing an epic spectacle that made me think of the audience many years ago watching the Chicago premiere or Aida with over 300 people on stage. This is really big. And you have to see it to believe it. The show begins when you drive up to the 18th Street parking entrance at Soldier Field and approach the enormous yet graceful white towered tent. The entryway is graced by a wire mesh sculpture of Italian lights in the shape of a horse, and as you enter the grounds, there are artist made sculptures of horses. A top hatted Dickens-esque character entices you to buy a program just outside the Big Top—very reminiscent of a circus hawker but so slick and theatrical: is this a play, or a Redmoon show? The all white tent is blacked out inside creating a mysterious entryway complete with gift shop and high end concessions: imported beers, pastries, and wine, along with expensive horse themed art. You enter the “ring” to find your ergonometrically designed big top seats. The sweeping scrim in front of you plays audience participation trivia and you notice that the band hovers above the stage in a tree house— the playing area is framed by artificial trees. The attention to detail is exquisite, and hints at the versatile set design by Guillame Lord that will be revealed behind the curtain. Hint, there is an actual mountain. And then the show begins. There is not plot or linear story here: the show is more like a Balanchine ballet program than a theatrical endeavor. 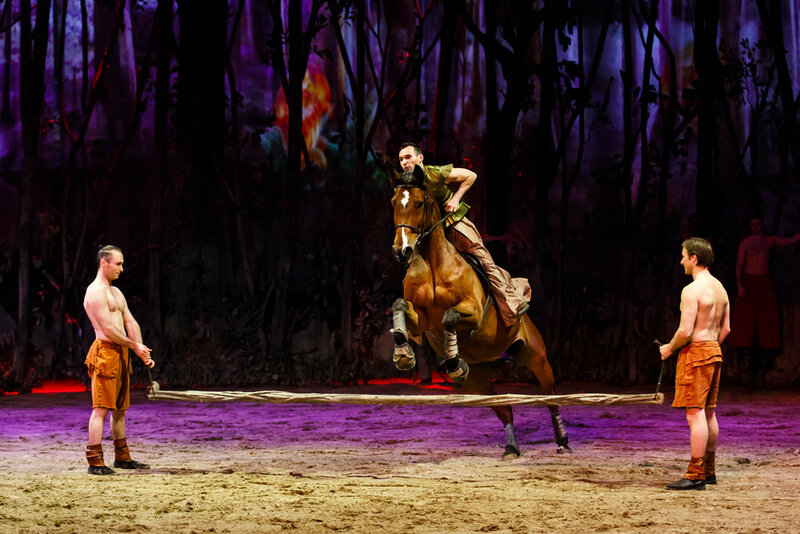 The various “acts” of a circus format are woven together in a seamless impressionistic throughline that begins with a herd of stunningly lovely horses at Liberty— a form that has a riderless, bridle free animal following hand signal of a performer who walks or runs with the horse. It is awe inspiring and moving. Like a corps de ballet, the horses move in a kind of unison, in patterns that please the eye and calm the soul. All the while they are accompanied by a live band: soaring vocalist Valentina Spreca, endurance guitar player Serge Gamache, Eric Boudreault driving the drums, Louis Bier Racicot on violin and Eric Auclair the band leader and bass player. The emotive world music/new age score by composer Michel Cusson plays off and responds to what is happening on stage like a conversation. Horses don’t always hit their music cues, and so the score has aspects of improvisation built in and the variety keeps the evening lively. Next come the Fairies: six women in white silk that billows out behind them as they stand, each on two horses in a form called Roman riding. It is strikingly beautiful. And then comes the Village Celebration, a section that includes ground based African acrobats, horses jumping over hand held rails, men in mechanical stilts with springs that allow them to leap and flip at heart stopping heights. It is the kind of bravura physicality that brings the crowd to their feet. After this crescendo, the projections on the expansive back wall shift, a show all its own with projection design by Geodezik, and we are in a new quiet environment where star performer Elise Verdoncq is surrounded by a herd of white Arabians that run and turn and posture in ways that are naturalistic yet geometric. The horses remind me of the original Balanchine dancers— all leg and line and youth. Verdoncq will quick change to join the next number, an intricate dressage exhibition. Dressage is the allegro section of horse riding, many steps and showing off, where you get to showboat your technique. 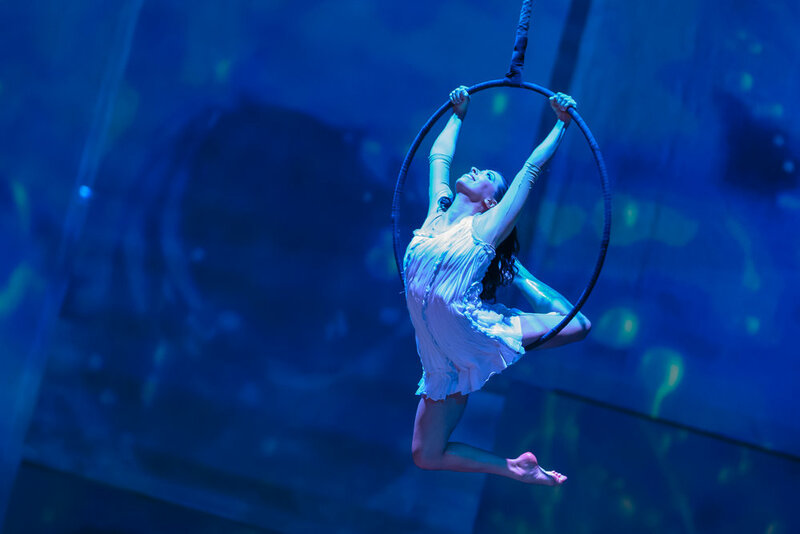 This section is followed by the first technical marvel that calls attention to itself: a carousel lowers from the ceiling and the acrobats make use of it to create a number that gives new romance to the concept of pole dancing. The first act finishes with rousing Cossack riding that caused the equestrian in my family to sit with mouth wide open. She noted that the performers went all Legolas (Lord of the Rings attribution) but when they did in the movie it was CGI and this was real. This first act finale will amaze you in true PT Barnum style. 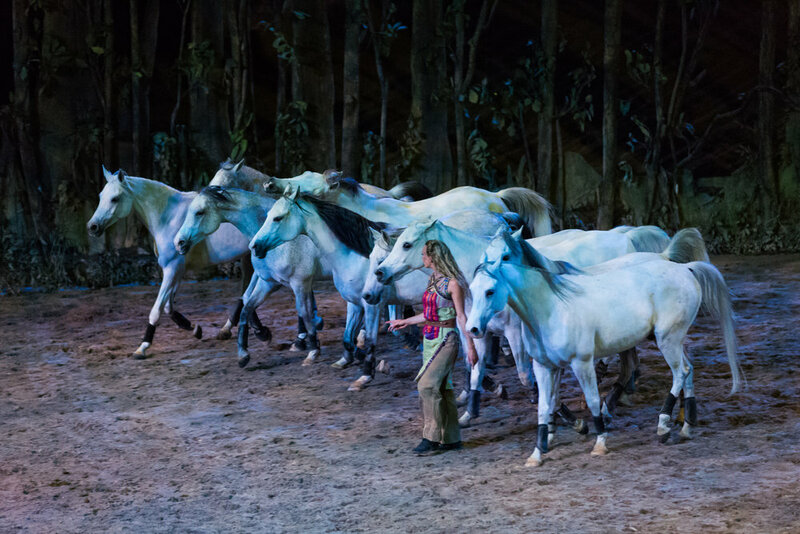 A lengthy intermission allows the staff to come out and roll the stage which is covered in a proprietary sand that stays ever moist and provides safe footing for the horses and acrobats. Think dry Zamboni. This sand will become even more important at the end of the show when they flood the stage in an eerie yet gorgeous transition where you are asking yourself, am I really seeing this, is this real? The second half kicks off with an epic Liberty number. At the opening night some of the horses were a bit frisky and behaved like tempermental superstars, running into a wing, then running back on. A Storm begins, actually raining on stage, and aeriealists dance high above the stage in rings. Next we get to enjoy the antics of the West African acrobats who drum their way into our hearts with a call and response chant to end all war on earth. After this we are visited by Angels: a white silks aerial piece that is dizzying. Then Verdoncq returns on her trusty and talented steed Omerio who proceeds to do a horse dancing routine as the stage floods. In a world that seems so dark, and a time where a dystopian gestalt has rooted itself in our collective consciousness, this section called the Great Adventure reminds us of our dignity and our history as a species that is capable of honor and grace as she is joined by a legion of people on prancing horses and they move across the stage in formations that are reminiscent of drill teams, but freer and more poetic. And then the riders and trick riders and acrobats and singer Spreca all come on stage for a finale that is as grand as anything in theatre. 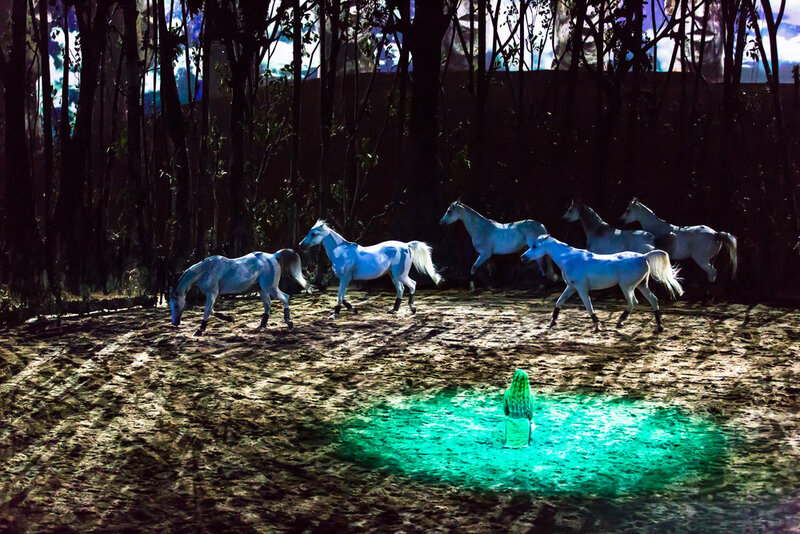 Cavalia’s Odysseo is an immersive experience. It has taken all these words to attempt to describe an experience that is visual and spiritual and outside the realm of words. The show is about something, but that meaning, as with all abstract art, is determined by the viewer. This show is an amalgam of performance types and it’s very nature is temporary, so if you want to experience it, you need to make it a priority this spring. Performance continue at the Soldier Field South lot until May 14, 2017 then the Really Big Top moves on. For tickets and information call 1-866-999-8111 or go to www.cavalia.com.